Defining and operationalizing Article 2 of the UNFCCC remains a challenge. The question of what is dangerous climate change is not a purely scientific one, as danger necessarily has a subjective dimension and its definition requires judgment and precaution. 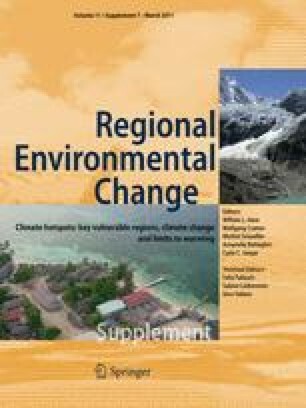 The papers in this special issue of Regional Environmental Change attempt to navigate this problem, by offering an overview of the latest scientific findings in the context of risks and uncertainties, and assess some key vulnerabilities that might lead to dangerous climate change. This synthesis provides an overview of the papers in this issue and looks at four areas of possible dangerous climate change—adverse declines in regional food and water security, loss of arctic sea ice with projected extinction of species, large-scale sea-level rise and loss of coral reef systems. These issues affect a number of different regions including Africa, South Asia, and Small Island Developing States. Significant risks to vulnerable regions and systems at warming levels of 1.5–2°C above pre-industrial are identified. The direct effects of CO2 concentration increases in terms of ocean acidification are identified as relevant to Article 2 because of the risks posed to coral reefs. Ultimate CO2 stabilization levels that allow for the long-term viability of coral reefs likely are below 350 ppm. The paper concludes by arguing that the emission reduction pledges made by countries under the Copenhagen Accord will not suffice to prevent dangerous climate change. The papers in this special issue of Regional Environmental Change address the question of what may be dangerous levels of climate change: the papers describe and analyse the vulnerability of human and natural systems in a number of regions around the world. The question of what is dangerous clearly relates to values and judgements about risk, and so is not a purely scientific one according to a widespread view of science. However, it is not a purely normative question either: it requires the ability and willingness to navigate the landscape between the two poles of pure factual description and pure normative evaluation. Scientists are often reluctant to express judgements, but in the papers collected in this special issue, after presenting scientific results, the authors have applied their own criteria and judgements for reaching what they see as reasonable conclusions. In some cases, authors have indicated changes that they consider to be dangerous, in others they have pointed to risks, vulnerabilities and uncertainties, which preclude in their view reaching conclusions at this point. Decisions are often made under uncertainty and based on perception and personal judgements. For this reasons, we believe that the articles in this special issues provide a necessary overview of what might be considered as dangerous climate change. Climate change is a global challenge. Scientific evidence has often failed to translate into stringent and effective policies. Investments in clean technologies and in adaptation are considered costs to society and often opposed to the need to safeguard the economy. Short-term criteria are usually applied to measure success in our societies, and we systematically fail to realize that investments in transforming our economies are not costs, but rather, indeed investments in the future. In this context, it is important to address the questions raised by Article 2 and try to define what dangerous climate change might be. Article 2 calls for a judgement, based on experience, scientific results and, when necessary, the precautionary principle. Scientists, policy makers and society at large need to take decisions and to act to prevent danger from becoming disaster. In this paper, we review the context of what is dangerous climate change under the terms of the United Nations Framework Convention on Climate Change (UNFCCC), we look at some of the issues involved in deciding what might be dangerous and why one would wish to make such a determination, and then attempt to draw some lessons for future consideration of the question by the scientific and policy community. “The ultimate objective of this Convention and any related legal instruments that the Conference of the Parties may adopt is to achieve, in accordance with the relevant provisions of the Convention, stabilization of greenhouse gas concentrations in the atmosphere at a level that would prevent dangerous anthropogenic interference with the climate system. Such a level should be achieved within a time frame sufficient to allow ecosystems to adapt naturally to climate change, to ensure that food production is not threatened and to enable economic development to proceed in a sustainable manner.” (UNFCCC 1992). Stabilization of greenhouse gas concentrations is specifically linked to levels that would “prevent dangerous interference with the climate system”, and these levels are to be achieved “within a time frame” sufficient for criteria (ecosystems, food production and economic development) to be met (Verheyen 2007). There is no specific reference to a particular timeframe by which this stabilization should be achieved, nor its manner, and this is open to be decided based on the criteria in Article 2. It is open, for example as to whether, concentrations would rise above an ultimate stabilization level, before falling back, providing that in the end anthropogenic interference with the climate system is prevented. Legally, it has been argued that Article 2 represents a prevention duty with consequential legal obligations that limits discretion for interpreting the term “dangerous” and that carries with it an obligation to take specific action to achieve this goal, including negotiating specific commitments to reduce greenhouse gas emissions (Verheyen 2007). The term “dangerous” is important for the interpretation of Article 2. The ordinary meaning of the word is that if something is able, or likely, to inflict injury or harm, or involves exposure to danger, then it is dangerous. A “dangerous” interference with the climate system then must be something that may cause harm or loss. Article 2 demands a judgment as to whether something is likely to cause harm or loss and how significant this may be. A change in the state of the climate system is not in itself dangerous, but its consequences may be. What is important in the context of the UNFCCC is that specific groups of countries are recognized as most vulnerable, and legally this implies that any definition of the term ‘dangerous interference’ needs to be oriented towards these countries and not necessarily towards the most resilient countries and regions (Verheyen 2007). Amongst the regions recognized as the most vulnerable are the small island developing states, least developed countries and mountain regions. The term “dangerous anthropogenic interference” (DAI) is not limited to short-term risks, but also to levels of climate change that may trigger highly adverse changes to components of the climate system that could take centuries to millennia to be fully felt. Examples include levels of warming that may not pose immediate threats, but in the future could result in the partial or complete loss of the Greenland and/or West Antarctic ice sheets, or cross other tipping point thresholds (Kriegler et al. 2009; Lenton et al. 2009; Malhi et al. 2009). Apart from global warming itself, dangerous anthropogenic interference with the climate system1 could occur as a result of increases in carbon dioxide (CO2) concentration causing ocean acidification (Orr et al. 2005), with the level of acidification largely independent of climate changes induced by elevated GHG concentrations (Cao et al. 2007; McNeil and Matear 2007). Ocean acidification adversely affects a basic aspect of the climate system and has consequences for ecosystems and human food production dependent upon marine organisms. Of current anthropogenic CO2 emissions, about 30% is absorbed by the oceans, in response to the higher CO2 concentration of the atmosphere (Denman et al. 2007). The acidity of the ocean waters rises when additional CO2 is absorbed. The increase in atmospheric CO2 concentration from 278 ppm in the pre-industrial period to over 387 ppm in 2009 has led to an increase in the ocean’s acidity, estimated at a reduction of 0.1 units of pH since pre-industrial (Meehl et al. 2007). Increasing ocean acidity poses a threat to many marine species and ecosystems and their productivity (Bates et al. 2009; Comeau et al. 2009; Feely et al. 2009; McClintock et al. 2009; Moy et al. 2009; Crawley et al. 2010; Manzello 2010; Shi et al. 2010), although uncertainties persist (Hendriks et al. 2010). It has become clear in the last few years that the onset of serious consequences of ocean acidification on marine may be contemporaneous with serious warming induced consequences on the same systems and species. Hoegh-Guldberg (2010) points towards serious and contemporaneous pressure on coral reefs from both acidification and warming: others have indicated serious risks for Arctic and Antarctic systems within several decades (McNeil and Matear 2008; Steinacher et al. 2009; McNeil et al. 2010). The three broad themes highlighted in Article 2—ecosystems, food production, sustainable economic development—provide some guidance as to its interpretation. Greenhouse gas concentrations must be stabilized in such a way and within a timeframe that ecosystems can adapt naturally, food production is not threatened and that economic development is able to proceed in a sustainable manner. Defining what it means for ecosystems to adapt naturally is quite difficult and may be best approached by examining the effects of climate change on key ecosystem properties, services and values. Substantial loss of, or damage to, properties such as biodiversity including conservation of species, food production and provision of livelihoods, may be relevant measures of ecosystem response to climate change. Large changes in the spatial extent and geographical location of ecosystems could be other measures. Midgley and Thuiller (2010) provide an example from southern Africa of large-scale projected damages to ecosystem values. With about a 2°C warming they predict for the endemic flora of southern Africa an average reduction by about 40% in habitat-specific species richness. For a higher warming of 3–3.5°C, projections for 5,197 African plant species show that 25–42% could lose all suitable range by 2085. For Australia, Hughes (2010) shows quite high risks for warming in the range of 1.5–2°C for the Australian Alpine region, the Great Barrier Reef, World Heritage rainforests and wetlands. In Europe, Alkemade et al. (2010) show an increasing and substantial risk of extinction with increasing warming, so that by around 3°C warming, 25% of the species are projected to disappear from Mediterranean Europe and Northern European ecosystems are transformed with 35% of species there newly introduced. Ni (2010) has looked at ecosystem changes in China and shows that large and rapid movements in ecosystems are projected. The loss of grasslands, high elevation meadows and steppe in particular could lead to losses of biological diversity. The Tibetan Plateau is one of the more sensitive regions containing many unique environments that are very sensitive and vulnerable to climate change and human disturbances. Warming of this region will accelerate the loss of permafrost and thereby contribute to the process of desertification (Ni et al. 2000). Meadows on the plateau would be reduced in extent (Zhao et al. 2002). Studies on the effects of warming and grazing on high elevation meadows indicate that these pressures could cause large, rapid declines in plant species diversity (Klein et al. 2004). The requirement to ensure that food production is not threatened might appear straightforward; however, the question of regional differences is paramount. Global increases in food production could, for example, be accompanied by reductions at regional levels whose consequences for food security would depend upon the regional context and the socio-economic scenarios assumed both globally and regionally. Is a large regional reduction in food security dangerous under the meaning of Article 2, even whilst globally food production may increase? Assume for example that Indian food production is reduced under warming, as suggested by Lal (2010). Indians might feel that this would be dangerous and an infringement on their right to development. Elsewhere, however, in regions where crop production has, or is projected to increase, there may be feeling that this is in fact an opportunity for greater exports, or at the least food deficits could be dealt via food aid programmes, in other words by compensation rather than by prevention. Tao et al. (2010) explore risks for food production in China and in overall terms find that there is insufficient work available to define whether the risks could be dangerous for agricultural production in China, with some likelihood of improved conditions. In common with many other studies of this region, this work shows the importance of the strength of the CO2 fertilization effect, which remains uncertain. Most studies show little adverse effects in China’s food production if CO2 fertilization works as projected, but significant reductions if not (Xiong et al. 2007a, b; Yao et al. 2007; Tao et al. 2009; Tao and Zhang in press). Unmitigated climate changes is projected to threaten sustainable economic development in a number of regions, causing significant problems in areas as diverse as health, water supply, agriculture, infrastructure damages and financial and other economic services (IPCC 2007). Barnett (2010) in his paper argues that the projected adverse impacts on the economic development of small islands is dangerous. Direct threats to communities in mountain regions were identified by Chevallier et al. (2010) for the Andes and Shrestha and Aryal (2010) for the Himalayas. Both papers provide a striking overview of glacial retreat, causing an enhanced risk of glacial lake outbursts and reducing water security during dry seasons. These changes threaten livelihoods directly through increased natural hazards and indirectly due to negative economic impacts on water security and hydro-energy potential. Effective mitigation of climate change may be a prerequisite for sustainable economic development in many regions whilst delayed mitigation and higher levels of climate change could lead not only to increased costs, but also hamper sustainable development. Beyond these three criteria, however, Crowley (2010) has argued that climate change will lead to human rights violations specifically in relation to the Inuit people of the Arctic and that this requires consideration by parties under the terms of Article 2 of the UNFCCC. Kittel et al. (2010) provide an insight into the profound changes in the Alaskan landscape and ecosystems that have been observed in the past 50 years, including by the Inuit people, driven by warming, permafrost thaw and sea-ice thinning and that are projected to accelerate the future. Whilst legally unclear in the context of the UNFCCC, the impacts of climate change on indigenous people and communities, particularly in polar and mountain regions was recognized as a key vulnerability in the IPCC AR4 assessment. Why is defining the ultimate objective of climate policy important? The large inertia in parts of the climate system and in socio-economic systems implies the need, long recognized, for decision-making on levels of mitigation far ahead of the time at which full certainty on the impacts of climate change would be achieved (Nordhaus 1977). It is therefore necessary to decide on the climate risks that are to be minimized or prevented in order to be able to actively manage other unavoidable emerging risks. Not deciding on what levels of risks to take, could in effect, be deciding to take higher risks given that large amounts of warming and sea-level rise would be irreversibly committed from emissions that might otherwise have been avoided (Friedlingstein and Solomon 2005; Wigley 2005; Hare and Meinshausen 2006; Donner 2009). Following from this is the need to have quantitative guidance on emission pathways that are consistent with limiting risks, and hence on the required mitigation and adaptation tasks that need to be planned for. Decisions made in relation to Article 2 (or not made) would determine the level of climate change that is set as the goal for policy (or which is committed to as a consequence of lack of action), and these decisions have fundamental implications for emission reduction pathways and technological requirements as well as the scale of adaptation required. In 1985 at a meeting in Villach, Austria3 an international gathering of scientists raised essentially for the first time the concern that projected human induced climate change would lead to unacceptable damages and changes to the earth, its ecosystems and to humans and human society. Since that time, several scientific assessment groups have sought to identify acceptable or tolerable limits to human induced climate change. There have been two broad approaches, often combined. One is based on a risk assessment using projected impacts of climate change on ecosystems, agriculture and other sectors. The other is based on a safe climate analogue approach which focuses on avoiding greater changes than are thought to have occurred in recent earth history (e.g., the current and the last few interglacial periods extending back half a million years or so). In this latter approach, the core idea is that tolerable human-induced changes are limited to those that would maintain the climate system within or close to a state in terms of greenhouse gas concentrations which is not very different than the present interglacial and away from states associated with large or rapid changes in climate and/or components of the climate system such as the present ice sheets of Greenland and Antarctica. One of the earliest attempts dating from the late 1980s to define acceptable limits to warming is that of the German Enquetekommission, a joint committee of Parliamentarians and scientists which set as a limit 0.1°C per decade as a level especially critical to forest ecosystems with an overall maximum warming of 1 or 2°C (Jain and Bach 1994). One of the most important contributions was that of the UNEP/WMO/ICSU United Nations Advisory Group on Greenhouse Gases (AGGG) which was established in 1986 (Potter 1986). It reviewed the early climate impacts literature as well as what was known at that time about the behaviour of the climate system in the past. In its report in 1990, the AGGG combined both approaches to identify two main temperature indicators or thresholds with different levels of risk (Rijsberman and Swart 1990). The AGGG found that an increase of greater than 1°C above pre-industrial climate levels “may elicit rapid, unpredictable and non-linear responses that could lead to extensive ecosystem damage” and that warming rates above 0.1°C/decade were likely to lead to rapidly increasing risk of significant ecosystem damage. A 2°C increase was suggested by the AGGG to be “an upper limit beyond which the risks of grave damage to ecosystems, and of non-linear responses, are expected to increase rapidly”. On sea-level rise, the AGGG argued that rates of sea-level rise of less than 20 mm/decade (20 cm/century) “would permit the vast majority of vulnerable ecosystems, such as natural wetlands and coral reefs to adapt with rates beyond this leading to rapidly rising ecosystem damage” and limiting total sea-level rise to a 50 cm increase above 1990 global mean sea level could “prevent the complete destruction of island nations, but would entail large increases in the societal and ecological damage caused by storms”. In the mid-1990s, the German Global Change Advisory Council (WBGU) determined an upper limit or “tolerable window” of warming based on a “top down” line of reasoning. It arrived at similar limit to the AGGG setting the tolerable warming limit of a 2°C increase relative to pre-industrial temperatures (WBGU 1995). Similar to the AGGG, it argued that above this limit there was a risk of “dramatic changes in the composition and function of today’s ecosystems”. This group confirmed this tolerable limit level in a subsequent assessment in 2003 which considered the question from a bottom up perspective based on a review of projected impacts (WBGU 2003). It was found that above 2°C the losses to species and ecosystems were “unacceptable” and that “above this global warming level worldwide climate-related losses in agricultural production must be expected”, with “a steep rise in the number of people threatened by water scarcity.” Ice sheet instability with consequential multi-metre sea-level rise was identified as a significant risk. It was recognized that “for some regions the effects of climate change would already lead to intolerable impacts at 2°C mean global warming”. More recently, the WBGU, in the context of a review on the world’s oceans, reconfirmed these goals and extended its tolerable limits, or guard rails, to sea-level rise where it recommended a long-term limit of 1 m with a maximum rate of 5 cm per decade, as “(o)therwise there is a high probability that human society and natural ecosystems will suffer unacceptable damage and loss” (WBGU 2006). A group of largely US-based scientists (Hansen et al. 2007; Hansen et al. 2008) have also investigated the issue of what might be dangerous climate changes, whilst acknowledging that identification of this “is partly subjective”. Several areas of risk were focused on—Increasing aridity in a number of regions (southern USA, parts of Africa, the Mediterranean basin and Australia), the stability of the ice sheets and long-term sea-level rise, Arctic sea-ice loss and warming, coral reefs, more intense tropical storms with increasing warming, and the likelihood of positive feedbacks amplifying warming due to the release of methane hydrates from the sea bed (which would add methane to the atmosphere, increasing the warming). Considering these issues they find that global warming of more than 1°C above 2000 “has effects that may be highly disruptive”. This temperature limit with respect to 2000 translates into warming above pre-industrial of below 1.6–1.7°C, significantly lower than the 2°C “tolerable” limit identified by the WBGU. They indicated CO2 levels need to be reduced to “at most 350 ppm, but likely less than that” and warned that if the over shoot of this level “is not brief, there is a possibility of seeding irreversible catastrophic effects”. More recent research on the long-term response of ice sheets to warming and coral reefs tends to support at least these elements of the findings of Hansen and colleagues. It is striking that the science-based assessments of what may be acceptable levels of human induced climate change have remained fairly stable over the last 20 years when expressed in terms of a global temperature limit. Different groups of scientists have successively found that between 1° and 2°C global mean warming above pre-industrial risks rise substantially, to the point where a level of non-acceptability is reached at close too or even below 2°C warming. In many respects, each assessment has confirmed the broad picture of risks first identified in 1990 by the UNEP/WMO/ICSU AGGG. Over the last 20 years, the Intergovernmental Panel on Climate Change has provided four full assessment reports as well as a number of supplementary and special assessments on specific issues on the area of climate change. By its mandate, the IPCC does not produce recommendations on what may or may not be acceptable levels of human induced climate change, as it is required to produce policy relevant but not policy prescriptive assessments. These reports have nevertheless been vital inputs into governmental processes considering climate issues since 1990. In 1996, the European Union, based on a consideration of the IPCC Second Assessment Report (SAR) which was adopted in 1995 (IPCC 1996), agreed a global goal of ensuring that temperatures do not exceed 2°C increase above pre-industrial (European Community 1996). This was reconfirmed by the EU Environment Council in 2005 (Environment Council of the European Union 2005) following consideration of the IPCC Third Assessment Report of 2001, and subsequently adopted by the 25 heads of government of the European Union (ENDS 2005; European Union 2005). The so-called 2°C goal became one of the planks of the European Union’s domestic and international policy, guiding both domestic reduction plans and international diplomatic efforts. In the lead up to the Copenhagen negotiations in 2009, the 2°C goal was adopted by the Major Economies Forum as well as by the G8 leaders meeting in that year (G8 2009; Major Economies Forum 2009). The conclusion of the IPCC AR4 in 2007 spurred consideration by the small island states and other vulnerable countries of the merits of the EU’s 2°C goal, as for these countries the AR4 had indicated substantial risk at lower levels of warming. Influenced by this assessment, and a number of the publications by scientific groups mentioned above, as well as growing evidence of impacts, in 2008 the Alliance of Small Island States (AOSIS) began calling for global temperature to be limited to below 1.5° increase above pre-industrial levels and the CO2 concentrations to be brought below 350 ppm as fast as possible. AOSIS argued that the EU 2°C goal was unacceptable due to the damage that would be delivered to small island states at this level of warming. In the course of 2009, the least developed country group and others also began calling for warming to be limited to below a 1.5°C increase above pre-industrial based on similar considerations. By the time of UNFCCC Conference of the Parties (COP15) in Copenhagen, December 2009 a total of 101 countries, accounting for 5% of global energy and industry related CO2 emissions and about 23% of global population in 20054 were calling for this goal to be adopted. Although the Copenhagen Accord is not a legal agreement as such, it does represent an important political interpretation at head of government level of the meaning of Article 2 of the climate change convention. It was concluded at Head of Government level and it specifically references the objective of preventing dangerous interference with the climate system. It is also clear that the emission pledges made by Parties to date under the Accord are not consistent with the 2° or 1.5°C goals (Rogelj et al. 2010a, b). The papers in this special issue all tend to confirm the picture of regional risks and vulnerabilities in a range of regions and systems around the world as reported in the IPCC Fourth Assessment Report. There are several new developments, however, which will be highlighted here. In relation to food production, the papers in this volume confirm earlier studies showing that climate change will induce strong contrasts between world regions, by causing yield increases in some and decreases in others, to an extent that is not easily solved by international markets (e.g., Battisti and Naylor 2009; Penny et al. 2010). Significant risks to food and water security are indicated for South Asia (Lal 2010; Mirza 2010), Sahelian and northern Africa (Sissoko et al. 2010), Ben Mohamed (2010), Mougou et al. (2010), Iglesias et al. (2010) and parts of Russia (Dronin and Kirilenko 2010) by the time global mean warming reaches around 2°C above pre-industrial. Lal (2010) shows that India needs to increase its production by 1.5% per year to feed its developing and growing population, faster than historical experience, but faces likely net cereal production losses in South Asia due to climate change of 4–10% for a 2°C warming. Lal (2010) further argues that warming above 3°C could have catastrophic consequences. Mirza (2010) shows a rapidly increasing risk for Bangladesh as warming rises towards 2°C, due to flooding, with losses plateauing as flooded area stabilizes, at a time that Bangladesh is projected to need to increase grain production by 3% per year (historically 2%/year). In contrast to European Mediterranean countries that are expected to be able to cope with drought trends in the larger context of EU agricultural policy (Bindi and Olesen 2010), Iglesias et al. (2010) lay bare the very low adaptive capacity of African Mediterranean countries that will be confronted with increased drought and associated yield reductions. In the Sahel region, Sissoko et al. (2010) explain how existing coping strategies may break down under the pressures of future development in the context of yield decreases, confirmed by Ben Mohamed (2010), who report a projected loss in yields of millet, a major staple crop in the region, of 20% around 2°C warming, rising to 40% at about 3°C. The picture for parts of the African region covered in this issue is consistent with recent reviews, which indicate quite large negative impacts on food production at levels of warming lower than 2°C above pre-industrial (Burke et al. 2009; Schlenker and Lobell 2010). As discussed by Scheffran and Battaglini (2010), the pressure created by projected climate change seems likely to lead to increasing conflicts and their causalities. Sutton et al. (2010) suggest that projected climate change effects could cause civil wars in Africa by the 2030s (warming at this time would likely be below 1.5°C above pre-industrial). Finally, Dronin and Kirilenko (2010) show that the existing administrative and institutional, as well as physical infrastructure in Russia will likely cause large problems for maintaining national food security and has historically contributed to famine in periods of drought. In Australia, (Steffen et al. 2010) show producers and industries operate from a long experience of coping with highly variable climate, but identified two climatic features that the sector is highly vulnerable to: abrupt climate shifts and intensifying droughts (see Risbey 2010). They point to the adaptive capacity of producers and industry as an important factor in determining what may be dangerous changes and argue that this sector has shown high adaptive capacity in the past and is beginning to adapt to changed climate variability now. The IPCC AR4 assessment indicated that food production at the global level will probably be sufficient to feed the growing world population in the coming decades taking into account the projected effects of climate change. Observed negative effects of climate change on crop production in some regions (Auffhammer et al. 2006; Lobell and Field 2007) and new assessments of projections and uncertainties in relation to the role of CO2 fertilization indicate a risk that global food production could be under more pressure from climate change than previously estimated (Lobell and Field 2008; Leakey 2009; Nelson et al. 2009; Rost et al. 2009; Schlenker and Roberts 2009). What emerges from the papers in this issue is the danger of a widespread deterioration of regional food security in the 21st century under climate change for warming levels in the 1.5–2°C range. Many refer to the low adaptive capacity in some regions. Indeed, the most salient picture emerging from the papers in this issue on agriculture impacts is that highly challenging large-scale changes are required in regional specialization of food production, trade policies, development planning and water management for the regions discussed to have any chance of maintaining food security in the coming decades given global warming projections. Loss of Arctic sea ice and its consequential effects on ice-based ecosystems and the Arctic marine environment are described by Johannessen and Miles (2010). An accelerating loss of Arctic summer sea ice and volume has been observed over the last 50 years amounting to a 50% decline (Serreze et al. 2007; Stroeve et al. 2007; Stroeve et al. 2008; Lindsay et al. 2009; Markus et al. 2009; Simmonds and Keay 2009), with losses occurring faster than predicted by models (Boe et al. 2009). Whereas the IPCC AR4 assessment indicated almost complete loss of late summer sea ice for some scenarios by the latter part of the 21st century, more recent projections indicate that this could occur as early as the 2030s (Wang and Overland 2009; Zhang 2010). Johannessen and Miles in (2010) estimate loss by the 2050s, but in any event by the latter half of the 21st century (Boe et al. 2009). The consequences for Arctic sea ice-based systems and species are serious (Johannessen and Miles 2010) with increasing loss of summer sea-ice extent and volume likely to push polar bears, walrus, some Arctic sea birds and seals to extinction. The IPCC AR4 indicated that the Polar bear (Ursus maritimus) faces a high risk of extinction with global warming in the range 2.5–3.0°C above pre-industrial based in the model projections then available, which projected a multi-model mean 62% (range 40–100%) loss of Arctic summer ice extent (Fischlin et al. 2007). With such losses projected now to occur at substantially lower temperatures (ca 1.5–2.0°C), the extinction risk for this iconic species appears to be very high within the next half century. Detailed population-based observations (Schliebe et al. 2008; Stirling et al. 2008; Regehr et al. 2010; Rode et al. 2010) and projections (Durner et al. 2009; Hunter et al. 2010) confirm this inference. Loss of unique and vulnerable polar communities was recognized as a key vulnerability in the IPCC AR4 (IPCC 2007; Schneider et al. 2007). Crowley (2010) makes a case for consideration of the loss of unique cultures, in this case the Inuit of the Arctic, as a basis for determining what is dangerous under Article 2: if it were to be accepted it could imply an even lower warming limit than 1.5°C. There have been significant developments in the projection of sea-level rise, which affects a number of the regions reviewed in this special issue. Recent studies (Rahmstorf 2007; Pfeffer et al. 2008; Rohling et al. 2008; Vermeer and Rahmstorf 2009) indicate that sea-level rise over the next century is likely to be significantly higher than the estimates in the IPCC AR4.7 The accelerating loss of ice from the Greenland and Antarctic ice sheets, which is occurring at a rate faster than previously predicted, was not able to be accounted for in the AR4 estimates of 20–60 cm above 1990 levels by the end of the 21st century. New projections based on the observed relationship between sea level and temperature (Rahmstorf 2007; Vermeer and Rahmstorf 2009) estimate a sea-level rise of 0.5–1.4 m above 1990 levels by 2100 for a warming range of 2–6°C above pre-industrial levels by 2100. Recent research on the relationship between Antarctic temperatures and global sea level over the last 520,000 years indicates that multi-metre increases in sea level over the next centuries from warming levels of only 2°C are very likely due to the loss of ice from the ice sheets (Rohling et al. 2009). Evidence from a previous climatic warm period (119,000–124,000 years ago, when the climate warmed to around present levels and a bit higher) shows that rapid sea-level rise caused by melting or disintegration of the ice sheets has occurred before. During that period, sea levels stood at 4–6 metres higher than at present, and the rates of sea-level rise averaged 1.6 m/century (Rohling et al. 2008). Recent examination of plausible melting and/or disintegration rates for the ice sheets suggest strongly that a metre or more is possible if not likely by 2100 and that two metres cannot be ruled out (Pfeffer et al. 2008). Sea-level rise of a few metres could result in widespread loss of coastal and deltaic areas such as Bangladesh, the Nile, Yangtze and Mekong Delta regions, as well as major losses for many small island countries. In the nearer term, sea-level rise and increased water temperatures are projected to accelerate beach and coastal erosion and cause degradation of natural coastal defences, including mangroves and coral reefs. These would in turn impact negatively on water supply, fisheries productivity and tourism industries in many small island countries and other regions. Sea-level rise will exacerbate the impacts of more intense tropical cyclones predicted under global warming (IPCC 2007; Bender et al. 2010; Knutson et al. 2010) on infrastructure. Sea-level rise of 0.5 m has been projected to result in the total number of people exposed to flooding risk in 136 port cities globally increasing by more than threefold to around 150 million people and the total value of assets exposed8 could rise by more than a factor of 10 (Nicholls et al. 2008). The top 10 cities exposed in term of population by the 2070s were Kolkata, Mumbai, Dhaka, Guangzhou, Ho Chi Minh City, Shanghai, Bangkok, Rangoon, Miami and Hai Phòng. On an asset base, the most vulnerable cities were found to be Miami, Guangdong, Greater New York, Kolkata, Shanghai, Mumbai, Tianjin, Tokyo, Hong Kong and Bangkok (Nicholls et al. 2008). Mirza (2010) reports that Bangladesh could lose 10% of its area due to a sea-level rise of 45 cm, and other work has estimated a loss about 18% of land area for a 95 cm sea-level rise (World Bank 2000). The risks linked to sea-level rise appear to qualify as a dangerous change and point towards warming levels significantly lower than 2°C above pre-industrial being needed to prevent dangerous interference with the climate system if this were defined as avoiding a sea-level rise significantly lower than a metre. Finally, another large-scale risk to emerge strongly from this special issue and in particular the review by Hoegh-Guldberg (2010) is that of the likely massive loss of coral reefs, due to the effects of warming and an increased CO2 concentration acidifying the worlds oceans. Coral reefs provide vital resources for many small island states and are highly sensitive to both warming and ocean acidification due to increased CO2 concentrations. High ocean temperatures have already started to trigger unprecedented mass coral bleaching events effecting entire reefs, regions and countries. The IPCC AR4 found that “Climate change is likely to heavily impact coral reefs, fisheries and other marine-based resources” (Mimura et al. 2007). With 1.5–2°C warming, widespread mortality of coral reefs was predicted (Fischlin et al. 2007). Since the IPCC AR4, scientific understanding of the risks to coral reefs has expanded substantially. Regionally, for example, projections based on IPCC AR4 climate model simulations indicate that severe thermal stress may become a biannual to annual event in the Eastern Caribbean by the 2020s or 2030s when global mean temperature is increased by about 1–1.5°C from pre-industrial levels (Donner et al. 2007). The most significant findings, however, relate to the effect of ocean acidification (Hoegh-Guldberg 2010). As CO2 concentration in the atmosphere rises, the oceans absorb more CO2, increasing the acidity of the oceans. An increase in ocean acidity has already been reported by the IPCC (2007). Higher ocean acidity reduces the ability of coral species to sequester calcium, which is vitally required for growth and maintenance of coral reefs (Fischlin et al. 2007). Reduced reef calcification has been observed since 1990 in some regions (Cooper et al. 2008; De’ath et al. 2009; Tanzil et al. 2009).9 It has been estimated that corals around the world are likely to stop growing once atmospheric CO2 concentration climbs above about 450 ppm, and would start dissolving above 550 ppm CO2 (Cao and Caldeira 2008; Silverman et al. 2009). Negative effects on the reproductive cycle of corals are also predicted (Albright et al. 2010). These and other considerations lead Hoegh-Guldberg (2010), and others (Donner 2009; Veron et al. 2009) to conclude that the survival of coral reefs implies a need to reduce CO2 concentration to 350 ppm or below. The warming limit for the viability of reefs appears to be substantially lower than a 2°C global mean warming, possibly lower than 1.5°C. The examples from the literature described above can be used to define levels of climate change that would constitute dangerous anthropogenic interference with the climate system under Article 2 of the UNFCCC. In the eyes of many, they imply the need to limit both global mean warming and CO2 concentration to levels, respectively, substantially lower than 2°C and likely below 1.5°C in the longer term and below present levels of CO2 concentration, likely below 350 ppm. The emission pledges made under Copenhagen Accord are estimated to result in a warming of 3.3°C above pre-industrial within the 21st century (Rogelj et al. 2010a, b), substantially above the levels of warming identified here as possibly dangerous. In relation to the CO2 concentration levels identified here as potentially dangerous, the Copenhagen Accord pledges imply that a CO2 concentration of 450 ppm could be reached as early as the 2030s (Rogelj et al. 2010a, b). CO2 concentration was about 278 ppm in pre-industrial times (mid-19th century) and as of the end of 2009 was around 387 ppmv10 (Friedlingstein et al. 2010), above the 350 ppm level that may be appropriated for long-term coral reef survival. See Fig. 1 for an overview of scenario projections. The emission pledges made under the Copenhagen Accord is, in view of the examples provided and the evidence collected in this special issue, insufficient to meet the terms of Article 2 of preventing dangerous climate change. More work needs to be done to further define and operationalize Article 2, but we need to accept that danger necessarily has a subjective dimension and that its definition requires judgment and precaution. UNFCCC Article 1.1 defines the climate system quite broadly as “the totality of the atmosphere, hydrosphere, biosphere and geosphere and their interactions”. For the theme of this section see also the contribution of Jaeger and Jaeger (2010). Those countries calling for global temperature to stay below 2°C comprise together a total of 46 countries, accounting for 83% of global energy and industry related CO2 and about 65% of global population in 2005 Sources: Emissions—PRIMAP Baseline Reference: PRIMAP3 (2009) Potsdam Real-time Integrated Model for probabilistic Assessment of emissions Paths (PRIMAP), http://www.primap.org. Population—UN (2008) ‘World Population Prospects: The 2008 Revision Population Database’, http://esa.un.org/unpp. The Copenhagen Accord does not reference these increases to pre-industrial or any other base year or period. The interpretation applied here is that this is a drafting oversight as there was no other target on the table apart from the 2° and 1.5°C increases above pre-industrial and there is no evidence that the pre-industrial reference period was removed for any specific reason or at the request of any party. http://unfccc.int/home/items/5262.php accessed 18 November 2010. The IPCC’s Fourth Assessment Report estimated that global warming of 1.7–7°C above pre-industrial levels (without mitigation) would raise sea-level rise by 20–60 cm above 1990 levels by the end of the 21st century. The accelerating loss of ice from the Greenland and Antarctic ice sheets, which is occurring at a rate much faster than previously predicted, was not able to be accounted for in the AR4 estimates. Whilst exposure to risk does not determine actual damage, it is a useful indication of the way in which risk is increasing with sea level rise and global warming as the world develops. Although some corals might be able to adapt to temperature changes within certain limits, there is one recent study showing that this ability might be reduced under high CO2 conditions: CO2 could act as a bleaching agent and even lower thermal bleaching thresholds (Anthony et al. 2008). The papers in this special issue stem in large part from work begun at a Symposium on “Key vulnerable regions and climate change”, 27–30 October 2004, in Beijing at the Institute of Atmospheric Physics, Beijing University/The Nansen-Zhu International Research Centre, organized by the European Climate Forum and sponsored by Munich Re, the Heinrich Böll Foundation, Deutsche Gesellschaft fur Technische Zusammenarbeit (GTZ), and the German Federal Environmental Ministry (BMU). The Organizing Committee of the symposium was formed by Bill Hare (PIK), Martin Welp (University of Applied Sciences in Eberswalde/ECF), Huijun Wang (Institute of Atmospheric Physics, Beijing University/The Nansen-Zhu International Research Centre, Beijing), Jiahua Pan (Research Centre for Sustainable Development, Chinese Academy of Social Sciences, Beijing), and Ola Johannessen (Nansen Remote and Environmental Sensing Centre, Bergen, Norway). We thank all authors for their contributions, updates and patience during the editorial process of this special issue. We also acknowledge comments made by a large numbers of reviewers. Technical editing was supported, at PIK, by Felix Fallasch, Vera Tekken and Sabine Lütkemeier.